Which are you more likely to have with you at any given moment  your cell phone or your wallet? Soon you may be able to ditch your billfold altogether and pay for things with a quick wave of your smart phone over an electronic scanner. In January, Starbucks announced that customers could start using a bar-code app on their phone to buy coffee in some 6,800 of its stores. This is the first big pay-by-phone initiative in the U.S., but we're likely to see more wireless payment options as something called near field communication (NFC) gets embedded into America's consumer electronics. In December, Google unveiled its Nexus S smart phone, which contains an NFC chip. The next iPhone is rumored to have one too, as are several BlackBerry models that are due out this year. Already in use in parts of Asia and Europe, NFC allows shoppers to wave their phones a few inches above a payment terminal  a contact-free system built for speed and simplicity. But before NFC becomes widely adopted in the U.S., a few kinks need to be worked out, like who will get to collect the lucrative transaction fees from retailers. Although Visa and MasterCard have been experimenting with wave-and-pay systems that use NFC-enabled credit or debit cards, cellular-service providers may try to muscle their way into the point-of-sale market. Three of the big four providers (AT&T, T-Mobile and Verizon  i.e., everyone except Sprint) have formed a joint venture that is set to roll out over the next 15 months. Its goal, "to lead the U.S. payments industry from cards to mobile phones," is hardly a subtle shot at Visa and MasterCard, but the consortium also seems to have hedged its bets by making Discover part of the venture. Meanwhile, Google claims it will be content to partner with payment processors to handle purchases made with its smart phones  even though the company has its own payment platform, Google Checkout. And who knows? If the next iPhone does come with NFC, the device may route mobile payments through Apple's iTunes store. The other big NFC issue, aside from how payments will be processed, is security. For instance, what's to stop a sophisticated thief with a concealed payment terminal from digitally pickpocketing you? "We're still not at the point where an attacker can just brush against you in a crowd and steal all the money out of your phone," says Jimmy Shah, a mobile-security researcher for McAfee. Although NFC-eavesdropping devices exist, he says, they "tend to require the attacker to play the man in the middle between your NFC-enabled phone and the cash register." 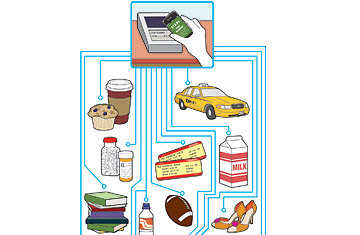 To protect consumers, NFC apps can encrypt data transmissions. Users may be able to set transaction limits as well, perhaps requiring a pass code to be entered for larger purchases. Still uneasy about this digital-wallet business? Keep in mind that if you lose your smart phone, it can be located on a map and remotely deactivated. Plus, your phone can be password protected. Your wallet isn't. This article originally appeared in the Feb. 21, 2011 issue of TIME.